Kathmandu, Dec 31, 2010 – Biotechnology Society of Nepal (BSN) organized a one day seminar on the theme “Brain Drain to Brain Gain” on 31st December 2010 at NAST Conference Hall, Khumaltar, Lalitpur. The program was organized in collaboration with Nepal Academy of Science and Technology (NAST), Non-Resident Nepali – Skill, Knowledge and Innovation Transfer Task force (NRN-SKI). The main theme of the program was about the sharing the knowledge gained by home coming students. 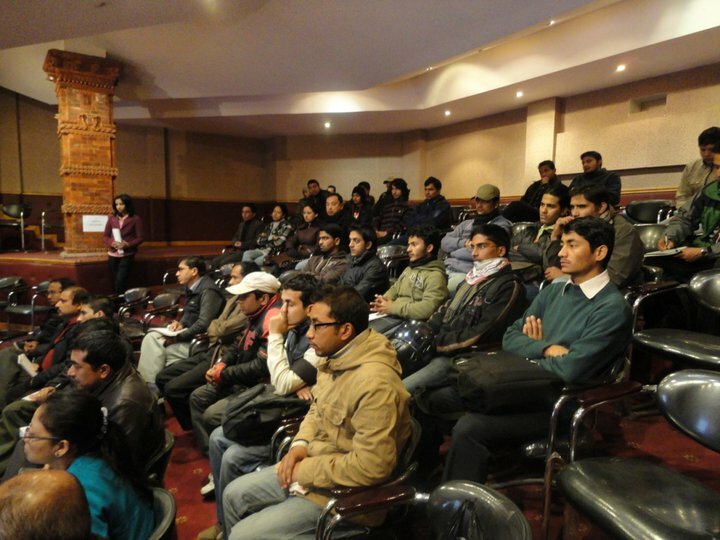 The program witnessed participants from different biotech colleges around Kathmandu. Also there was an enthusiastic participation of scientists representing different biotech organization and research institutes of Nepal. Four speakers from different field discussed on several aspects of science and its development. Mr. Hom Raj Acharya, Executive Director (NRN-SKI), talked about the prospective of Nepalese students in Nepal and abroad. He also discussed about how NRN could help the innovative and young scientists. Dr. Jyoti Tandukar (Associate Professor, Institute of Engineering (IOE), Tribhuvan University) discussed on ‘Reinventing Success’. His presentation was inspirational and eye opening and based on contemporary issues in Nepal. He raised an issue regarding our habit of underestimating the market value and technical advancement of Nepal in the field of IT. He provided some good examples where Nepalese technologies are used in the international market. The importance of self-learning and being up-to-date in the field of one’s interest were highlighted in his presentation. The idea of information sharing was emphasized as pivotal. Similarly, Mr. Ramkrishna Shrestha, a Computational Biology graduate (University of East Angelia, UK) presented on ‘The Next Generation Sequencing Technology and Assembly Algorithms ‘. His presentation included both traditional and the modern technologies being used in the world in sequencing. He discussed about the research practices, particularly in genome sequencing and bioinformatics, and also on how new ideas could be converted into research. Mr. Raunak Shrestha represented the iconic and leading organization in the field of biotechnology in Nepal, Center for Molecular Dynamics Nepal (CMDN)/Intrepid Nepal Pvt. Ltd. The representation of the company was there because it is established by scientists and professionals who worked and studied abroad. The successful establishment of this company sets a definition of Brain Gain for all. Mr. Shrestha talked about the establishment of the company and its infrastructures. He also briefed about the current and future projects of CMDN/Intrepid Nepal. In addition to this he discussed how Intrepid has been conducting training programs and how it can be a possible place for working for the students of relevant field. The program was concluded with a discussion session where guests were invited for free interaction with the speakers. The program was a success and first of its kind with such a unique theme. The second program in the series is scheduled to be held at Central Department of Biotechnology, Tribhuvan University (TU), Kritipur on 14th of January 2011. Lalitpur, an adjoining city to capital Kathmandu, recently hosted one of the major conferences on youth leadership. “National Youth Conference 2066” was organized in Staff College, Lalitpur on 22nd and 23rd February 2010. The event was hosted by National Youth Organization Federation Nepal (NYOFN), an organization that has 162 Non-Government Organizations (NGOs) as its organizational members. Its head office is located in Tinkune, Kathmandu. The conference was attended by the members of the NYOFN and few other delegates and a mass of around 300 people. Also Biotechnology Society of Nepal (BSN) was represented by Mr. Pawan Bashyal (Treasurer, BSN). It was formally closed by Honorable His Excellency Mr. Pramanda Jha, Vice President of Nepal. Following topics were discussed in the conference. The entire program was more focused on youth leadership and participation of the younger generation in the proper utilization of natural resources of the country. Climate change, Biodiversity and Natural resource management and Tourism caught the main attention of the program. Some of the speakers also stressed in ways to effectively mobilize youth and the community in main stream national development at local level. There were also discussions on micro-entrepreneurship and revenue generation form even the smallest possible means. The conference was more fruitful in terms of exchange of ideas that will certainly lead to proper planning towards national development. There were also concerns over carrying the youth’s voice to the Constituent Assembly and making laws/policies that can encourage the youth community to participate in national development. Biotechnology Society of Nepal thanks all the participants who made the theater show “Pani Photo” a grand success. 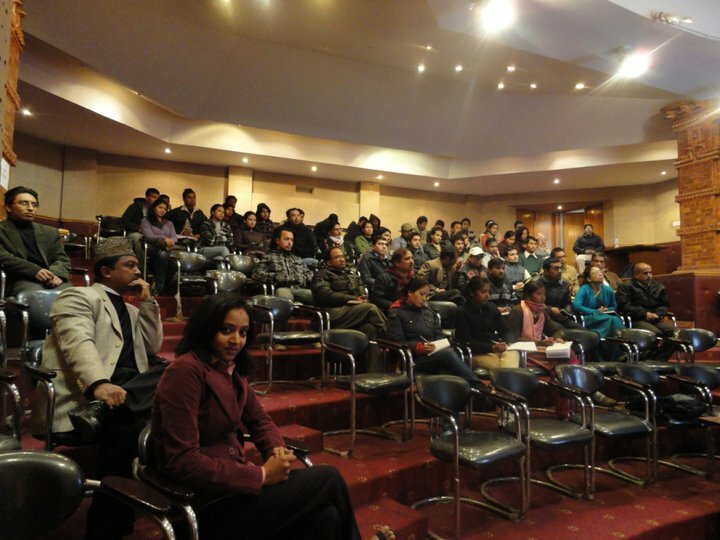 The show was held on 20th Feb 2010, at Sama Theater, Gurukul, Kathmandu and it was viewed by over 150 audience. The play “Pani Photo” (The Negative) was about a grieving parents whose only son has disappeared during the armed conflict period in rural Nepal. With humorous touches in between the play was contemporary, realistic and informative and was able to touch the chord with the audiences. It has been a learning experience and we could do better with such programs in future. Biotechnology Society of Nepal (BSN) proudly presents a theater show “पानी फोटो – the negative” on 20th Feb 2010 (8th Flagun 2066). The show will be staged in the Sama Theater, Gurukul @ 1:00 pm (sharp). BSN would like to invite all the interested people to watch the show and support BSN. We have proposed following criterion in the upcoming BSN E-Bulletin. What you can communicate for publishing? 1. Technical articles (Short original or Review) max 2-2.5 A4 size. 3. Article related to biotechnology (not necessary to be a research article). 4. Being the first Bulletin, you can also express some greeting / compliments for BSN. Trainings that could fill the gap between academics and professional standards by producing skilled manpower in the field of research and diagnosis had been long awaited. Intrepid Nepal has taken an initiation to generate modern science and technology experts particularly in Molecular biology and associated fields. The training program entitled “Extensive training on Molecular and Immunological Techniques” which is tentatively scheduled for two weeks from 30th June to 17th July 2008 and covers latest molecular techniques plus immunological tests, considered the most rapid and confirmatory in the detection of pathogen of all sorts. 8. Theories underlying behind each process and DNA sequencing too..
PCR (Polymerase chain reaction): technique that has enhanced sensitivity and accuracy will be covered in the training program. Trainees will be conducting hands on sample preparation such as Nucleic acid extraction from biological sources, pre-amplification procedures, amplification and finally post reaction analysis including verification of the product generated. Furthermore the courses include Protein extraction from different sources (Possibly from Microorganisms), analyzing them on Gel (SDS PAGE) and studying their characteristic bands against standard Protein markers (again another process for diagnosis of pathogens). They will also be taught about buffer and reagent preparation, plus their significances and limitations, whose role is immensely important in the process of experimentation. Likewise, QPCR (Quantitative Real Time PCR): modified form of conventional PCR will also be included, at least to provide introduction on its role on quantitation of bacterial pathogens, viral load (such as HIV or HBV) in clinical samples and antiretroviral treatment efficacy, and detection of genetic alteration etc. ELISA (Enzyme Linked Immunosorbent Assay): WHO recognized technique, will be provided to learn hands on for HIV-1 and HBV. The training will also include theory behind DNA sequence analysis and genetic profiling. We believe that this opportunity provides everyone with a wide range of opportunities and trainees will get in-depth knowledge about modern techniques that would help individuals in seeking their career goals in research and diagnosis. A member of BSN, Ms. Deepali Singh has set off for a three weeks long educational visit to India. She will be visiting research institutes, universities and industries related to Biotechnology. The main objective of her visit is to bring mutual relationship between those institutes and BSN. This kind of relationships, we hope, will help us in information exchange between Indian institutes and us. Moreover, this will also give us an exposure to international companies and research institutes which will in turn help us to understand the high pace of development in this field. A second grand event on science and technology this year after the Fifth National Conference on Science and Technology organized by NAST, is going to be held in Nepal. Fourth Asian Conference on Biotechnology and Development with the objective to promote understanding of the economic and social importance of research and development of biotechnology among Asian countries is commencing from February 12th, 2009. The program is hoped to be a great milestone in the development of this particular field in Nepal. The two day program jointly organized by UNESCO (United Nations Education, Science and Cultural Organization), RIS (Research and Information System for Developing Countries) and NARC (Nepal Agricultural Research Council) includes presentations from scientists from more than fifteen different countries and stakeholders from Nepal.